This past week, we finally got the chance to watch the film First They Killed My Father, directed by Angelina Jolie and released on Netflix. It is based on a true story from the book of the same name about a young girl’s experience during the Khmer Rouge. Jolie fell in love with Cambodia while filming Tomb Raider in 2000, later adopting a Cambodian child and becoming close friends with Ung Loung, author of First They Killed My Father. We found the film to be respectful and balanced: it memorialized Cambodia’s past suffering without becoming overly bleak; it acknowledged the beauty of the country and its people without becoming overly sentimental. If you are looking to learn about the facts and figures of the Khmer Rouge period, you might feel that this film is lacking. For better or worse, the story is seen entirely from the perspective of a child. As a result, we were often unclear about the passage of time, distances traveled and the historical context of events depicted. However, what you do get is a highly experiential look at the sights, sounds, smells and emotions of this time period that only a child’s eyes could provide. 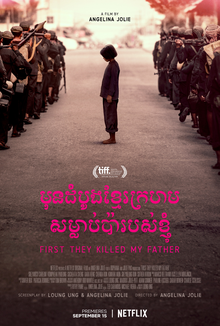 If you want to know more about the traumatic period that continues to affect Cambodians, or if you just want to know more about the context in which we live and serve, we recommend you check out First They Killed My Father.